your breath away. Definitely a must in Los Angeles. Venice Beach and Santa Monica Pier. Venice Beach and Santa Monica Pier are one of the most photographed spots in Los Angeles as they perfectly reflect the diversity of the city. From young couples skating, to adults walking their pets. All lifestyles and personalities of the city converge. In spring you can find one of the most famous wheels of fortune in the US, delicious cotton candy, pretzels, and more. Getty Center. Goya, Van Gogh, Cezanne, Titian and Rembrandt ... all in one place. In honor of the businessman and philanthropist John Paul Getty opened the Getty Center in Los Angeles in addition to the previously established Getty Villa in Malibu. This museum contains historical and priceless pieces that certainly worth admiring during your visit to LA. Admission to the museum is free every day. Staples Center. Home to the world famous LA Lakers host the Grammy awards. This is one of the most famous multipurpose centers worldwide. While visiting LA do not forget to attend a basketball game of the Lakers or Clippers to live to the fullest. During the summer are the semifinals and finals of the conference of East and West. Live at most one of the most characteristic sports in the United States in a tight game next to some celebrities who are also regulars Lakers fans, such as: Denzel Washington, Jack Nicholson, Ice Cube, Anthony Kiedis and Flea, both members band Red Hot Chili Peppers. Walk of Fame and Chinese Theater. From Meryl Streep to Marilyn Monroe, all icons of the film industry is located here. More than 2,000 stars reflect the achievements of great artists, both the music industry and film. This site is definitely one of the must of Los Angeles. 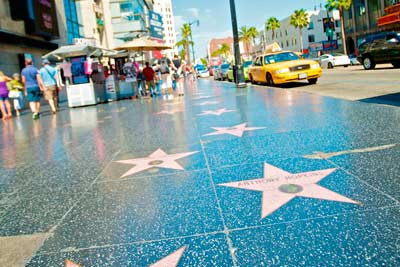 This famous avenue has had its share in such films as Pretty Woman, The Italian Job, Charlie's Angels, and many more. You can not stop visiting. West Hollywood along with spruce with names like Fred Astaire and John Lennon on the floor is home to the famous Chinese Theatre. Dolby Theatre (formerly Kodak Theatre). It's the recognized home of the highest recognition in Hollywood: the Oscars. For decades this building was named after its sponsor, Eastman Kodak. However in 2011, when the company declared bankruptcy, Dolby bought the theater and therefore the rights to the name. Besides being the home of the Academy Awards, the Dolby Theatre presents world-class concerts like Celine Dion, Paul McCartney, Santana, Sting and Prince; and some Broadway musicals. Walt Disney Concert Hall. This is the fourth concert hall of the Music Center of Los Angeles, and the headquarters of the Los Angeles Philharmonic and Choir Master of the city. The ability of this compound is 2 mil 265 people. The design of this majestic concert hall is very similar to the Guggenheim Museum in Bilbao by Frank Gehry is considered a great achievement for many acrquitectos due to the acoustics of the place spotless. Beverly Hills and Rodeo Drive. Of course, a must activity in LA is shopping, and what better place to buy the sophisticated Via Rodeo. From Christian Dior, Tom Ford, Zegna, Louis Vuitton, Hart Schaffner Marx, Prada, St. John, Fendi and many more. The best brands are found in this area. Whether to buy designs or simply stroll in the trolley watching the houses of the rich and famous can not miss Beverly Hills and Rodeo Drive. Museum of Hollywood and the Hollywood sign. The Hollywood Museum is the official museum of the great artists, has the most extensive collection of Hollywood memorabilia in the world. With four floors of exhibits stored over 10,000 priceless pieces for the film industry, you can not fail to visit. Observed thousands of costumes, photographs, props, posters, and even automobiles. From the white dress Marilyn Monroe up boxing gloves he used to impersonate Stallone Rocky, everything is in this museum.